Are Water Rights Sufficient to Protect Water Users? In December, ahead of the Water Board hearing, Governor Brown and Governor-elect Newsom both asked the Water Board to hold off and let the districts, the State, and the federal government finalize the voluntary agreements. But that didn’t happen and the problem is now in Governor Newsom’s lap as his Water Board will likely have to turn its attention to defending its decision in court. The State Water Board’s decision on December 12, 2018 doubles the amount of water the State will take away from farms growing food, the parks and sporting fields where our children play, and even the water we drink from our taps at home and bubbling out of drinking fountains at schools. And if flow requirements can be imposed on the San Joaquin River they can be imposed anywhere. The sad thing is there was an alternative available, but the Board has so far rejected it. 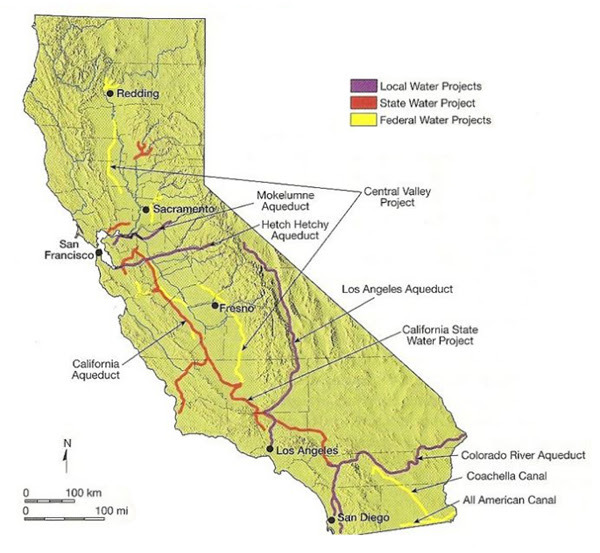 Farmers in the San Joaquin and Sacramento valleys, irrigation districts, the Department of Water Resources, Department of Fish and Wildlife and the Bureau of Reclamation, worked collaboratively at the behest of both Governors Brown and Newsom, to propose a voluntary plan designed to quickly accomplish more for fish and the environment without the drastic harm water users expect from the water cuts. Under these proposals farms and cities would still give up billions of gallons of water to the river during times that science tells us that it’s needed, as well as implement projects that improve habitat for fish, reduce predators and enhance ecosystems far beyond what the Board’s water-only plan could achieve. The voluntary proposals, expected to produce more salmon than the plan adopted by the State Water Board with less harm to the economy, would have been a win for all – farms, fish and folks. California’s State Water Resources Control Board (SWRCB) voted Wednesday to approve the Bay-Delta plan, which will re-allocate water from farms and cities to the environment in an effort to restore dwindling fish numbers. The plan will require tributary rivers within the San Joaquin watershed to maintain an average water level of 40% of “unimpeded flow” — that is, the flow that would exist without human activity — during the spring season. The result is that less water — “billions of gallons,” according to the Fresno Bee — will be available to the farming communities of the Central Valley, as well as to San Francisco and its suburbs, which rely on water from the area. Last month, outgoing Gov. Jerry Brown and incoming Gov. Gavin Newsom asked the SWRCB to delay its vote by a month to allow time for local water authorities to reach voluntary settlement agreements (VSAs) as an alternative to the new plan. In the interim, several local irrigation districts did, in fact, commit to investing in conservation and environmental projects that would theoretically help restore fish populations without giving up quite so much water. The Trump administration has promised to take legal action to block the plan, which may be moot as a result. Some environmental groups have criticized the Bay-Delta plan for not going far enough. The California Water Commission was awarded $816 million of Proposition 1 money to begin building the $5.2 billion Sites Reservoir — the state’s first big reservoir since the 1970s. The $7.5 billion Proposition 1: Water Quality, Supply, and Infrastructure Improvement Act of 2014 bond was passed on a bi-partisan basis with seven funding categories of spending, including $2.7 billion pre-allocated for water storage projects only. The other $4.8 billion of Prop 1 voter-approved cash was allocated to protecting rivers; groundwater sustainability; drought preparedness; water recycling; safe drinking water; and flood management projects. Although $1.1 billion had already been awarded for 673 projects by December 2017, nothing had yet been awarded for water storage, according to the Public Policy Institute of California. The California Water Commission’s failure to move forward to fund any of the 12 proposed major above-ground water storage projects in four years prompted huge complaints from Republicans. Assembly Republican Leader Brian Dahle (R-Redding) walked into the commission’s February meeting pulling a children’s red wagon with 4,000 signatures on petitions to accelerate funding the Sites Reservoir north of Sacramento, and Temperance Flat in the San Joaquin Valley. Dahle told the commissioners, “Farmers like myself are concerned about the shortage of water – we’re seeing another drought cycle,” according to the Sacramento Bee. The commission finally announced $1 billion in funding on July 23 to expand Pacheco Pass Reservoir in southeastern Santa Clara County and Los Vaqueros in Contra Costa County. Temperance Flat dam on the San Joaquin River did receive $171 million, but supporters complained that the grant would cover only 6 percent of the $2.7 billion cost. The commission followed up on July 25 with an $816 million award to fund Sites Reservoir, which will divert water from the Sacramento River in the three rainiest months of the year to create a new lake up to 520 foot deep that could store 1.81 million acre feet of water. The Bee reported that although the Sites project received Prop 1’s top funding, supporters were angry that that the commission cut their request by more than half. At a total cost of $5.2 billion, it is unclear that the water districts that could benefit from the project will be able to line up the other $4.4 billion to break ground on the project. Environmentalists are expected to claim that the Sites Reservoir is a threat to the Sacramento River’s fish populations, and file lawsuits to delay the project. In 2017, when cracks appeared in the Oroville Dam’s spillway, more than 180,000 Californians faced the prospect of floods. The emergency came a few years after Californians had overwhelmingly approved Proposition 1, a ballot measure to spend $7.1 billion on water-storage projects. In the drought-stricken Golden State, where runoff from rain and snowmelt races uselessly into the Pacific Ocean, the proposition won wide support, with voters approving it, two-to-one. But four years after passage, the state water commission has yet to assign a dime of funding for storage. California once performed miracles in building infrastructure to quench the thirst of its residents and agricultural producers. In the 1960s, Governor Pat Brown oversaw construction of the San Luis Reservoir, capacity 2 million acre-feet. Approved for construction in 1963, it was completed by 1968—five years from start to finish. Those days are long gone. Any surface-storage project now faces years of litigation from environmental groups such as the powerful Sierra Club. At every stage in the construction process, delays of months or years ensue to resolve well-funded lawsuits launched under every conceivable pretext, from habitat destruction to inundation of Native American artifacts. Nevertheless, the California Water Commission has finally announced its plans to fund new projects with the money from Proposition 1. Many Californians were surprised to learn that the proposition’s fine print stipulated that only a third of the money was ever intended to fund water storage. The rest is earmarked for other projects, ranging from habitat restoration to levee upgrades. Neither the commission nor most of the applicant agencies offer clarity as to how much additional storage the projects will add to California’s normal water supplies in an average year. Clearly, some of the projects will make a tremendous difference to California’s parched water economy. The proposed Sites Reservoir, to be built just west of the Sacramento River, promises a capacity of nearly 2 million acre-feet; it alone could contribute a half-million acre-feet or more to the state’s water supply even in drought years, and much more in years with normal rainfall. Similarly, the Temperance Flat Reservoir will expand an existing reservoir on the San Joaquin River. Propitiously located south of the delta, this 1.3 million acre-foot construction could contribute 250,000 acre-feet or more to California’s water supply, even in drought years. To appreciate how much capacity these two projects would add, consider that California’s total residential water consumption — indoor and outdoor combined — is only 4 million acre-feet per year. None of the other proposed projects comes close to matching these two, but in any case, it will be years before this new infrastructure can capture one drop of rain or runoff. The Sites Reservoir application anticipates completion by 2029; the Temperance Flat Reservoir, by 2033. Constant litigation, combined with years of legislation empowering unions and state agency bureaucrats to slow construction, have quadrupled the time required to build — and sent costs soaring. In 2018 dollars, Pat Brown’s San Luis Reservoir cost $672 million; the Sites Reservoir is projected to cost $5.2 billion — seven times as much, for a nearly identical facility. To eliminate politically contrived shortages, Californians should embrace an all-of-the-above strategy to increase water supplies. They should select projects that yield the best return on investment while they take a hard look at what’s driving construction costs out of sight. Proposition 1 was a mandate to solve a solvable problem — store runoff to eliminate water scarcity. But California legislators have dragged their feet on implementation, betraying their constituents and exemplifying the state’s dysfunctional political culture. When it comes to water issues in California, not just quality of life, but life itself, is at stake. Ed Ring co-founded the California Policy Center in 2010 and served as its president through 2016. After pressure from the Association of California Water Agencies and others, the final form of these bills, Assembly Bill 1668 by Assemblywoman Laura Friedman, D-Glendale, and Senate Bill 606 from state Sen. Bob Hertzberg, D-Los Angeles, offers water districts more flexibility in enforcing the new restrictions. But the focus of AB 1668, limiting indoor water use to 50 gallons per resident per day, is a step too far. Way too far. As can be seen, in a state where total human water diversions total around 65 million acre feet (MAF) per year , in 2010 residential customers only consumed 3.7 MAF [2, 3]. According to more recent data obtained by the Sacramento Bee from California’s State Water Resources Control Board, by 2017 the average California resident consumed 90 gallons per day, which equates to around 4.0 MAF per year. Slightly more than half of that is for indoor water, which means that on average, Californians are already consuming less than 50 gallons per day per resident! So why the new law? We must immediately rule out the desire to save significant amounts of water. On average, Californians are already in compliance with the new restrictions on indoor water consumption, meaning only a minority of households, those over the new cap, will be forced to reduce consumption. And while AB 1668 also mandates individual “water budgets” for outdoor water consumption, even if they cut all outdoor water use by another 20%, that would only save 400,000 acre feet. But at what cost? That’s a lot of money. But why? How many households are still “overusing” water, if the average consumption is only around 50 gallons per day? For what it would cost Californians who are not taking their clothes to the laundry mat, who prefer to wash their dishes in the sink, who are not willing to stand under shower heads that cannot rinse soap out of long hair, who don’t want to purchase side loading dishwashers because it hurts their back to load and unload them, how much water will actually be saved? And how does one “overuse” indoor water? Doesn’t it flow down to the sewage treatment plant, where these plants release all that water back into the streams and aquifers, or even in some cases pump the water back uphill to be reused by residents? For outdoor water use, the solutions are even more draconian, and, of course, are disproportionately aimed at people who happen to live in homes with yards. People with lawns where their children play, people with trees that provide shade, people with aesthetically pleasing hedges that offer privacy, people with who love to grow flowers and vegetables – people who love living things. In the short run, these people will be visited by water agency bureaucrats, who will assign a “water budget.” How much will that cost, forcing local water agencies to reach out individually to 12.5 million residential property owners? In the long run, the costs to manage outdoor water use will get much higher. Every home will need to have two meters, one to measure indoor water use, one to measure outdoor water use. These meters, increasingly, will be “smart,” able to monitor time-of-day use in anticipation of variable pricing depending on when you water. (Don’t water your plants after 9 a.m.!) And eventually, first in new construction, and later in retrofits, every home will have two sources of water supply – one pipe to provide potable water for indoor use, and a separate pipe to provide marginally less potable reclaimed water for outdoor use. This is epic folly. These conservation measures, as described, are going to cost consumers tens of billions of dollars. When fully implemented, the total annual savings might be around 500,000 acre feet. That’s less than one percentof California’s total human water diversions for agriculture, the environment, commercial, industrial, and residential use. And not one dime of this money will be instead paying for water treatment, water storage, or desalination projects that could add millions of acre feet to California’s annual water supply. Thomas Mathus was an English cleric and scholar living in the early 19th century who developed the theory that global population increases exponentially, while global production increases arithmetically. His theory, and the eventual collapse of civilization that it implies, has enjoyed lasting and ongoing influence. In California, it found its earliest expression in a 1976 speech by Gov. Jerry Brown, who announced that we had entered an “era of limits.” For over forty years now, Governor Brown, and like-minded environmentalists and the politicians they’ve influenced, have embraced the Malthusian vision. But there is an alternative. The devil is in the details, of course. What “real processes” are they referring to? One of the authors, Michael Shellenberger – who just ran as a Democratic gubernatorial candidate in this week’s primary – offers concrete examples. Shellenberger, who runs the nonprofit “Environmental Progress” in Berkeley, is a progressive Democrat. And yet he strongly advocates nuclear power, desalination plants, and permitting suburban housing developments on California’s vast tracts of cattle rangeland. There is a convergence possible here, of pro-growth progressive Democrats joining independent voters and Republicans to embrace ecomodernism instead of malthusianism. In practical terms, this would mean rejecting rationing of water, energy, land and transportation, and instead investing in infrastructure for the 21st century. In ideological terms, it would mean rejecting environmentalist extremism rooted in pessimism in favor of economic growth rooted in optimism. California’s voters have not questioned Malthusian policies, partly because they’ve been oversold the environmentalist agenda, and partly because too many of them have been convinced that nothing matters more than the color of their skin or the consequences of their gender. As a result, leftist oligarchs have been left free to consolidate their interests. Water rationing is just one manifestation of policy-driven artificial scarcity. This Malthusian policy also informs suppression of energy development, land development, and sensible investment in road and freeway upgrades. Public money is diverted to preposterous projects such as high-speed rail, while private investment in energy and housing is proscribed to exclude all but the wealthiest players. And those politically connected billionaires then make outrageous profits when their products – energy, utilities, housing – are produced at constant costs but sold at scarcity driven sky-high prices. The reason Malthusian ideology constitutes the conventional political wisdom in California has little to do with the environment. It has to do with power and profit. These spectacularly wealthy special interest billionaires have coopted politicians, mostly Democrats, to spew the rhetoric of environmentalism and identity politics because it makes them richer, at the same time as it has made everyone else poorer. Everyone knows that California has the highest cost-of-living in the United States. But less understood is where all that money is going. It is going into the pockets of left-wing billionaires. To ensure government complicity, government unions get their cut, in the form of staggeringly over-market rates of pay and benefits. Permanent water rationing sets a horrific precedent. It also is just the wrong way to solve water scarcity. Let farmers sell their water to cities without losing their grandfathered water rights. For that matter, reform the water rights that allow farmers to buy water for next to nothing. Invest in more surface and ground storage to harvest storm runoff. Build desalination plants on the coast of Los Angeles County – BIG ones like they use in the Middle East, producing millions of acre feet per year – using less energy than the Tehachapi pumps. Water is life. People should be able to use as much water as they are willing to pay for, and if they are required to pay a slight premium for overuse, that can fund investment in more water infrastructure. But the law as written will impose punitive fines for overuse. For less money than the cost of implementing water rationing, Californians could experience water abundance. From fragrant lawns to a rejuvenated Salton Sea, to not having to choose between taking a shower or doing the laundry, Californians can enjoy a better quality of life. We don’t have to live in a society defined by Malthusian struggle. We can create abundance of water and energy in ways that are largely if not completely decoupled from environmental harm. Conservation has its place but when it is the only solution and is not accompanied by increasing supply it reveals its hidden agenda: Greed for money on the part of the firms that manufacture the instruments of conservation, greed for power on the part of the politicians that enforce conservation, and a contempt for the aspirations of ordinary people on the part of environmentalists who have let their principles run amok. Nobody should have to submit to monitoring of how they use water and submit to punitive fines if they use more than our ration. The idea that everyone has to submit to draconian restrictions on their water use is ridiculous. It comes from a Malthusian mentality that is admirable in moderation and tyrannical in the extreme. Just six weeks ago, Gov. Jerry Brown’s hopes for a huge, difficult legacy project to solidify California’s statewide water distribution system – one funded by water districts, not directly by taxpayers – appeared in bad shape. Years of lobbying for what the Brown administration dubbed the WaterFix project had produced more indifference and outright opposition than support. The $16.7 billion plan would build two 35-mile-long, 40-foot-high tunnels to take water south from the Sacramento River to the State Water Project pumps in the town of Tracy. The governor argued that this would sharply reduce the intermittent heavy pumping that played havoc with endangered species in the fragile Sacramento-San Joaquin River Delta and would firm up supplies both for Central Valley farmers and the 20 million-plus residents of Southern California. But in September, the board of the Westlands Water District – which serves 600,000 acres of farmland in King and Fresno counties and is the largest U.S. agricultural district – voted 7-1 against providing about $3 billion for the project. Westlands officials trashed claims made for WaterFix, questioning whether it would actually stabilize the Delta ecosystem and predicting cost overruns. In November, the Trump administration announced that the federal government would not provide any financial assistance to get the project built. While the Interior Department statement was not unexpected, it contributed to the sense the WaterFix proposal was foundering. By February, Brown administration officials had put the word out they would accept building only one tunnel under the delta and adding a second later. The death of the original plan appeared confirmed on April 2 when officials with the Metropolitan Water District of Southern California – the giant, politically powerful water wholesaler serving 19 million people – issued a memo expressing support for the one-tunnel option. The rationale: a lack of a consensus for the two-tunnel plan among the water districts south of Sacramento that would need to pay for the project. But after intense lobbying by the Brown administration, on April 10, the MWD board voted by a 3-to-2 margin to endorse the two-tunnels project and to agree to pay for about two-thirds of the tab – about $10.8 billion. The weighted vote, based on the size of individual agencies, came over the objections of the MWD board’s single largest member, the San Diego County Water Authority. Momentum continued to build last Wednesday when the board of the Santa Clara Valley Water District – the biggest water agency in Silicon Valley – voted 4-3 to commit its 2 million ratepayers to pay up to $650 million for the project, or nearly 4 percent of the total tab. Santa Clara officials had previously narrowly opposed providing funding. On Thursday, Brown hailed the decision in a speech to a conference of the Association of California Water Agencies in Sacramento. But the governor also warned that the project still had big obstacles that went beyond getting more water districts to agree to share construction costs. He noted that state and federal regulators still had yet to issue required permits. On this front, WaterFix may face more skepticism in Brown’s backyard than in Washington. As CalWatchdog reported last year, the Trump administration gave a key senior Interior Department post to Colorado lawyer David Bernhardt, a veteran of California water wars and a critic of the federal government’s traditionally high-profile role in land-use decisions in Western states. Meanwhile, the California Water Resources Control Board has sided with environmentalists in a long list of previous decisions. In filings with the state board, Restore the Delta and several other environmental groups have challenged the governor’s project on its central claim: that it improves the health of the Delta ecosystem. Even if the state and federal permits are granted, the tunnels plan still faces hurdles. The Bay Area News Group reportedlast week that more than two dozen state and federal lawsuits had been filed against the project. California took a big step Friday toward launching a new multibillion-dollar wave of reservoir construction. After being accused of being overly tightfisted with taxpayer dollars, the California Water Commission released updated plans for allocating nearly $2.6 billion in bond fundsapproved by voters during the depths of the drought. The money will help fund eight reservoirs and other water-storage projects, including the sprawling Sites Reservoir in the Sacramento Valley and a small groundwater “bank” in south Sacramento County. In its new blueprint, which remains tentative, the Water Commission nearly triples the amount of money it will spend compared to a preliminary allocation it put out in February.